Cups an Espresso Cafe, a coffee shop on Jackson Avenue, is beginning a series of weekly performances by local artists. 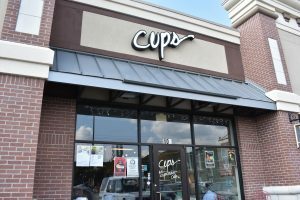 It began the initiative this month, but Cups owner Lee Bowie has always had a passion for combining his business ventures with local artists and artistic inspirations. It was not too long ago that Bowie opened Shelter on Van Buren, a coffee and arts venue concept on Van Buren Avenue that intertwined both his passions. Unfortunately, Shelter closed in January 2017, a year after opening. It was known as a local hot spot for artists and writers as well as a hub for the arts community. Many were sad to hear of Shelter’s closing and feared it would weaken the unique vibe the arts community has worked hard to bring to the city of Oxford. However, even after the closing of Shelter, Bowie has remained loyal to his mission to keep the arts involved in Oxford and his businesses. As a result of the community’s combined dedication, the arts in Oxford continue to thrive today. This series is just one of the many ways Cups hopes to get back to supporting local musicians and artists, and it isn’t the first time the shop has held live performances. The coffee shop used to hold shows and events regularly in 2014 and 2015, Bowie said. He said Cups took a break in 2016 but is hoping to get the community more involved by having weekly artists. He also said it had a few shows again this summer but hopes to have a consistent schedule for the school year. Not only are these shows a great way for new artists to get their names out there, but they also bring a different feel to Cups. It is a popular place for locals to hang out, whether they’re stopping in on their way to work or sitting down with friends and coworkers for weekly meetings or study groups. Bowie said he hopes these events will bring in more customers who don’t usually go to Cups or haven’t heard about it. He also hopes to be able to transition the same artistic vibe of Shelter to the new endeavor at Cups. These shows provide students and residents a place to relax and unwind while hearing good music and drinking some freshly brewed coffee. Cups is excited to be hosting Anne Freeman this coming week and upholding a welcoming environment for all customers. Anne Freeman will be performing from 6 to 7 p.m. this Wednesday at Cups.